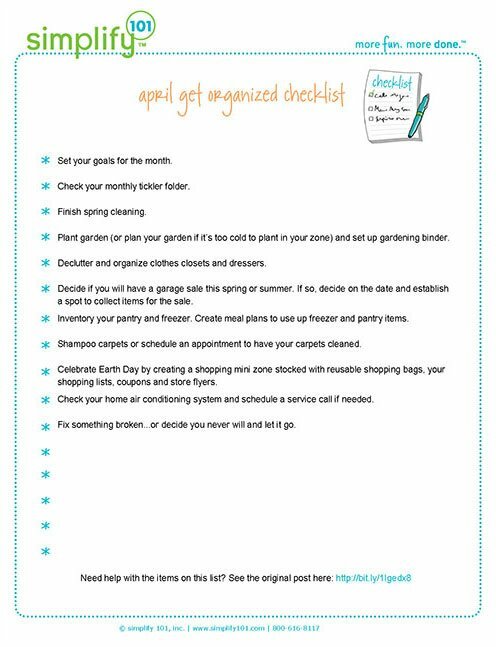 In anticipation of April first…no foolin’…we’ve got your April Get Organized Checklist all ready to go. Woohoo! Let’s make it a terrific month. Set your goals for the month. What do you want to accomplish or make progress on this month in terms of your personal goals? Take a few minutes today and write it down and then make a plan to make it happen. Check your monthly tickler folder. For those of you who have taken my paper clutter class and use a tickler file…remember to check your April folder today or tomorrow and disperse the contents into your daily folders! Finish spring cleaning. Good news…we have another month to get the spring cleaning finished up. Well, at least I do. No trips planned for April…so I’m hoping to make some good progress. You can use this checklist to organize your spring cleaning. Plant garden (or plan your garden if it’s too cold to plant in your zone) and set up gardening binder. I can’t wait to get some green stuff growing in the yard again! I also plan to put together a simple binder that I can use to capture what we planted, how well it grows, what we enjoy eating and all that kind of fun stuff. Make spring / summer shopping lists for new clothes, shoes, and accessories. 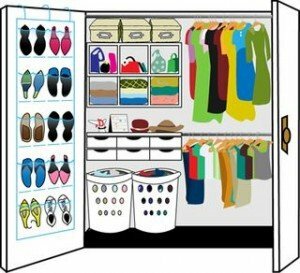 As your organize and declutter your closets, make a shopping list of new items you and your family members need for the upcoming seasons. Decide if you will have a garage sale this spring or summer. If so, decide on the date and establish a spot to collect items for the sale. Also, check out these two blog posts How to Organize a Yard Sale Part 1 and Part 2 for more ideas on organizing your own garage sale. And…if you’re on the fence about having a garage sale or not, read this post called To Garage Sale or Not to Garage Sale? Be sure to check out all the great ideas and thoughts in the comments section, too. Shampoo carpets or schedule an appointment to have your carpets cleaned. Celebrate Earth Day on April 22 by creating a shopping mini zone stocked with reusable shopping bags, your shopping lists, coupons and store flyers. Aside from the reusable shopping bags idea, you might be wondering how this is an Earth Day activity. Well…when you shop with a list you’re less likely to make spontaneous purchases of unneeded items. This is is a planet-friendly thing to do. Not only do you keep clutter out of your home (an important part of the planet) but you keep items from ultimately ending up in a landfill. Check out this post for more ideas on creating an errands mini zone. If you’re not up for an errands mini zone, consider keeping a stash of reusable shopping bags in your car. You’ll always have reusable bags with you when you’re out. Declutter and inventory Easter baskets and decorations. Create a shopping list for basket stuffers. If you celebrate Easter, check out this post on Stuffing Easter Baskets + Other Easter Stuff. Check your home air conditioning system and schedule a service call if needed. You’ll thank me in June for this one. Fix something broken…or decide you never will and let it go. Who did this one last month? I’m going to keep it on the monthly get organized checklist for a while because fixing or letting go of broken items is a really powerful thing to do! Let me know if you took the challenge last month…or if you plan to this month. Just to say I have not been receiving your posts for sometime now and I am really missing them.